The situation in Afghanistan after more than 12 years of U.S. occupation is getting worse by the day. The United States continues to support and make deals with the Taliban in order to guarantee that their designs for the country are fulfilled, most importantly keeping 9 military bases in the country after the official withdrawal of troops in 2014. President Karzai and the Afghan people are tired of the U.S. double-dealing and have decided to stop all negotiations. Hello! This is John Robles, I’m talking with Dr. Zalmay Gulzad. He is a Professor at Harold Washington College in Chicago in the Political Science Department. Gulzad: Very good, thank you very much. Robles: First question: can you give our listeners a little bit of an update? And we’d really like to hear what you think about this situation currently in Afghanistan, especially with this kind switch of events that are happening right now, as far as Russia supporting Karzai etc? 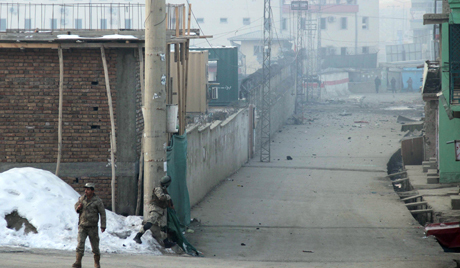 Gulzad: The situation is that the area is totally in chaos. Afghanistan, Iran, Syria and Turkey and all these areas are in trouble. What Afghanistan really wanted to have is: the Afghans must lead the peace talk, that was the goal. What happened was that the United States as usual, we have seen the history, the United States has this very strong alliance with the Pakistani military, and also with the Pakistani secret police, the ISI. Everybody in the world knows that Talibans are supported by the Pakistani military and by the ISI secret police of Pakistan. So, if that is happening, America and Taliban are going to talk, the Pakistani military and the ISI, because they are good allies and the United States is giving $2 billion a year to the Pakistani military, they said “Fine!”, they created this. Robles: Karzai, wasn’t he agreeing to the same thing, to allow bases to remain in Afghanistan? So what happened there? Gulzad: Karzai has agreed mostly that nine bases should be given to Afghanistan. One condition isd there that most Afghans are asking the United States, that the United States should push the Pakistani military not to support any more, while the Americans and the NATO are leaving, they should not support the Taliban, so that Afghanistan has peace. But the United States is largely saying to Afghans that we cannot do that. So, the objective is this: America wants to make a secret deal, to sell Afghanistan to Pakistan and to the Taliban and the Afghans are not going to accept it. The other thing is the building which was dedicated to the Afghan Taliban, they’ve put the name on it: Islamic Emirate of Afghanistan, and they were flying the Taliban flag. Immediately the Afghan Government and the Afghan officials, they objected to that, that is why Karzai got mad. Okay, this is supposed to be: you are recognizing Taliban as an entity. And Taliban also used that office to send their delegation to Iran. They were trying to use it. So, that’s why today’s situation got very bad. Karzai says that we are not going to talk to you anymore about the American troops staying in Afghanistan until things change. So then Kerry, called Karzai in Kabul and he said that the Taliban will not fly the American, I mean the Taliban flag over the building and also they will not call it the Islamic Emirate of Afghanistan. So, the problem is this: the mistrust between the Afghan Government, the Afghan people and the United States, is because the United States always supported the Taliban, (Al Qaeda is supported by the Taliban), and the United States is having this secret alliance with the Pakistani military, even though there was some sort of election in Pakistan after which the Muslim League, which is a very religious party, won the election. But still, the military is in control. Nawaz Sharif will become the Prime Minister, he was overthrown by Gen Musharraf in 1991. He was in jail, he was in exile in London and Saudi Arabia but he’s back now, he is the Prime Minister, but he is afraid of the military. The military is calling all the shots in Pakistan. Robles: What are the chances right now of things being worked out, I mean where do you see the Taliban going? What is the future looking like right now? Gulzad: The future looks like this: United States wanted to make a deal with Pakistan and with Taliban in order to get their bases, because the United States always looks for their own interests, short term. As I said before, the nine bases are very important because they are in the north of Afghanistan, west Afghanistan, central Afghanistan, out of Afghanistan and east Afghanistan. East Afghanistan, northeast Afghanistan is for China, north Afghanistan is for Russia, the west of Afghanistan is for Iran and the south Afghanistan is for the Persian Gulf, because it is 150 miles and they could keep an eye on the Persian Gulf, the Strait of Hormuz and all this. Because the Unocal Company, which is a California-based company, contributed money to his election. Clinton made a deal with them, they said: “Okay, as long as Taliban could bring stability in Afghanistan, then there will be this pipeline which is coming from Turkmenistan through Afghanistan to the Indian Ocean. So, Clinton didn’t give a damn about what Taliban was doing to the Afghan people and Afghan women, and all this. All he was concerned about was how this pipeline should go. He didn’t care about Democracy, he didn’t care about anything. The only thing he cared about was that this pipeline could go so that he could pay back the Unocal who gave him a lot of money in his election. Naturally I don’t blame Russia, I don’t blame China, I don’t blame India and all these big powers, they are very nervous because if they leave a lot of these countries such as Pakistan, everybody will arm their own ally, there will be a war. And this war is going to spread, it has already spread to Pakistan and it’s going to spread to the former Soviet Republics, Islamic Republics of Uzbekistan, Turkmenistan and Tajikistan, and that will have a major impact on the future of Russia. Robles: And what role do you see for Russia right now, in the short term and in the long term? Gulzad: Russia has a major role. I don’t care what people say that Russia is finished and all this kind of stuff. The people in Afghanistan and in the area are looking forward to see Russia play a major role in the politics of that area. The people of Afghanistan always had good relations with Russia. You were listening to an interview with Dr. Zalmay Gulzad. Dr Zalmay Gulzad spoke to the Voice of Russia's John Robles about the history of Al-Qaeda and the Taliban in Afghanistan and about how the USSR assisted the Afghan people and built almost everything there is in the country. Dr. Gulzad details how the US turned their own "freedom fighters" into the very "terrorists" that they are now fighting and he says the US wants to stay in Afghanistan for a very long time due to its strategic geopolitical location. Hello! This is John Robles, I’m talking with Dr. Zalmay Gulzad. He is a professor at Harold Washington College in Chicago, in the Political Science Department. Robles: First question I’d like to ask you. Now: you were born in Afghanistan and live in the US, you work in the US. How do you feel about the invasion of Afghanistan by the United States of America? Gulzad: Let me start with this: I was a young member of PDPA (People Democratic Party of Afghanistan). I supported the Afghan revolution. Unfortunately at that time I was in the United States, but I did support the revolution in Afghanistan and I supported the Soviet Union’s support for the Afghan revolution. There was one Soviet Union journalist Vladimir Pozner, at the Soviet time. Him and I did a review “Question and Answer for American people”. I was a student, I was getting my Phd and he came to Madison Wisconsin. I know Vladimir Pozner very well and we met. So, my point is that it is an aggression. These are the people who the United States supported, they are the criminals, they’re bandits, the so-called “freedom fighters” because they were fighting the Soviets and the communism and all this. And today the same people are attacking the United States and they call them terrorists. Why didn’t they call them terrorists in 1980s? Robles: I’ve been trying to get that point across to a lot of people and people are missing that for some reason. Gulzad: 15,000 Soviet troops were killed to fight these bandits, but the United States always went with the short victories, went with the criminals. The criminals that they trained: Bin Laden and the Arab terrorists, and the Pakistanis, and all these Taliban and Mujahidin, and “they” turned against them (U.S.). Unfortunately, this land of democracy that I live in is a joke because nobody is asking their leader: “Why did you make that mistake. ?” I used to call them freedom fighters, today they are terrorists. How come it changed in one day? Robles: Do you have any details yourself about how the Taliban got their start, how Al Qaeda got their start, how Osama Bin Laden got his start fighting the Soviet Army in Afghanistan? Gulzad: 1978 Afghan revolution, the Soviet Union recognized us and most progressive countries in the world recognized that revolution. Jimmy Carter was the President of the United States. He started it: with Zbigniew Brzezinski, they started it to arm, to find the people to oppose the Afghan state because they considered, they thought: that this is the soft belly of the Soviet Union. They thought that from Afghanistan they are going to infiltrate in the Muslim Soviet republics of Tajikistan, Uzbekistan, Turkmenistan and Azerbaijan. So what they did… Now, they couldn’t find too many Afghans, very few Afghans opposed it, because the Communist Government gave them land and everything else, so they couldn’t find too many Afghans. So, what they did is they went to Anwar Sadat and to the Arab reactionary regimes, they found unemployed Arabs, unemployed Pakistanis (the Pakistani regime was a dictatorship, not only military, but it was a religious Zia-ul-Haq regime in Pakistan). What they did, they brought all these criminals to Pakistan which is bordering with Afghanistan for almost 1000 miles. So what they did, the CIA started training them and sending them to kill the Afghans, destroy the Afghan revolution. So, then naturally, “naturally”, it is a very natural thing, the Soviet Union had to… because there was a friendship treaty with Afghanistan. 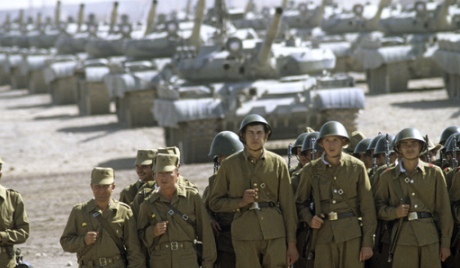 The Soviet Union and Afghanistan signed the friendship treaty in September 1978. So according to that treaty the Afghan Government was able to ask the Soviet Union, in case they were in trouble, to ask for the Soviet Union to help and the Soviet Union provided that help. So, the point is that the United States taught these criminals, dropped them there to fight not only the Afghan Communists, but then they thought they will make it the Soviet Union but now… And that is how all that process started through Pakistan. Pakistan was a reactionary regime of military. So, Afghanistan became a sandwich between two: Shia and Sunni Muslim fundamentalists. Gulzad: I fight it every day. I fought it even at that time when Ronald Reagan was in power. Vladimir Ponzner will be the witness on that. We had a Progressive Afghan Student Organization and I was the head of it. My point is that you cannot compare the Soviet Union because Afghanistan People’s Democratic Party had the same ideology as the Communist Party of the Soviet Union. So, the idea was that Afghanistan PDPA was giving land, Afghanistan was a very poor country, an almost feudal society, so we were giving land to the poor. What person is going to rise against you if you give them a piece of land? If you teach their daughter and son? They (The U.S.S.R.) built schools, they built everything that is in Afghanistan today, I am telling you as an Afghan! Every road, highway, dam, factory, airport that you can see, the infrastructure of Afghanistan is made in the USSR. Robles: Few people know that. Gulzad: Including Bagram that today the American Imperialists are sitting there. It is the Soviet Union that built everything. Thousands of Afghan students, including my brother, became educated in the Soviet Union. I mean “what the hell?” people are going to… It was Not the people! Do you know that there was a recent interview on BBC and CNN. They went to Kandahar and to Ghazni, two cities in Afghanistan. They were asking people… An Afghan farmer he spit on the American journalist! Certainly! And they showed it on TV, I saw it on BBC and Aljazeera. Robles: So, what is the real situation in Afghanistan right now, after almost 13 years of US occupation? Gulzad: My point is this: that if you want to stop this war, you should go to Pakistan. Pakistan is a very poor country. Pakistan is controlling the Taliban, the Al Qaeda, everybody. If United States wants to stop this war, then United States could squeeze Pakistan economically and in many ways! Pakistan is a joke! So, my point is that the United States wants to prolong this war because they want to stay in Afghanistan. The United States has total control economically and militarily over Pakistan. The former Soviet Union built everything in Afghanistan including the bases which the US is now occupying, the United States is supporting Radical Islamic groups, including Chechen terrorists, to destabilize countries they are targetting. Syria is the most secular progressive country in the Muslim World yet i being attacked by the West and all of the US actions are back-firing on them, they believe that quick victory is the proper route. They are worng. All of theses issues were discussed in an interview with Dr. Zalmay Gulzad, an Afghan native who teaches Political Science at Harold Washington College in Chicago. Gulzad: The point is that what the United States is doing and NATO is doing: they want to prolong this war with the collaboration of the Pakistani army. The very government in Pakistan is a joke, is silly, is nothing. The decisions are made by the military, the military is with the United States. Robles: What are the reasons, I mean, why does the US want to be in Afghanistan and in your opinion, resources or what? Gulzad: It is very important geopolitically and I will tell you why. Afghanistan is now very poor and I salute the Soviet people because the Soviet Union (the former Soviet Union) because Afghanistan has so many resources and now they have revealed how many resources they have. The Soviet Union did not take any of it. They did not take advantage of it, because we have petroleum, we have copper, we have so many things now. They gave the biggest copper mine to Chinese now, and in the Central Afghanistan they have the steel and all that kind of stuff. So anyway, the reason that United States wants to prolong this war and stay there is because; first of all we have a 150 mile border with China. Then we are very close to Russia, if you pass Tadzhikistan, it’s Russia, and then we have Iran, then we have Persian Gulf, so Afghanistan is a very important. Now I’ll tell you that these bases that United States is using today which were made by the Soviet Union. One in the north of Afghanistan is American base now, and Shindand, the Soviet Union built it, it is bordering with Iran and Pakistan, then Kandahar, then you have Bagram, which is north of Kabul, now they are building a base almost everywhere including Badakhshan. Badakhshan is not too far from Tadzhikistan and the Chinese borders. And also the United States is supporting the Uyghur Muslim group and Tadjiks in Xinjiang Province, which is bordering Afghanistan. They are making trouble for the Chinese Muslims. And also United States is supporting the Chechen group in Russia. Robles: Which group did you say in Russia? Gulzad: In Russia, the Chechen group. Gulzad: And also in China they are supporting Uyghur and Tadjiks. Robles: I think they would support any group that will destabilize or weaken any country that they want to attack, I think. Gulzad: Absolutely. My point is that when they are saying that the Cold War is over, they were anti-communists. What the hell? I mean today Russia is not a Communist country. Robles: No, we are not. Gulzad: But the point is that United States have a phobia and they want to be the imperialist power. What they are doing with the world today: my God!! I always discuss with my colleagues here that… Okay, how many countries did the Soviet Union invade? How many countries has the United States invaded in our lifetime? How many wars? Just recently: Panama, Nicaragua, Afghanistan, Iraq, for no reason, for no reason. Robles: Iraq, Iran, the list goes on and on. Gulzad: In Syria, they want to know, why doesn’t the United States want to… (if they are such champions of human rights and democracy) …why don’t they say anything about Saudi Arabia, Kuwait, Qatar, Bahrain, all these kingdoms? Gulzad: Why Syria? Syria is more secular, more progressive country. Robles: I don’t understand… Okay Syria; they were just attacked, about 50 people, this was yesterday, 53 people are said to have been dead by an Al-Qaeda group. Israel is bombing Syria, and the United States, so we have Israel, Al-Qaeda and the United States working together (Working together right?) to destroy Syria. Doesn’t that seem strange? Gulzad: Absolutely. And how it’s backfiring!! Let me tell you something. Just a few months ago I did an interview on American television here, on the so-called Arab Spring. So what’s happened? I told them, the United States is not supporting the progressive group; intellectuals. They don’t have to be left group but just regular progressive secular groups. What they did: they supported the most radical Islamist group, the problem was Mubarak, because they were sick and tired of Mubarak. They wanted to find a new puppet. What happened is it backfired! Guess what? Who won? The Islamic fundamentalists. In Libya they did the same thing because they are too stupid here because they think that quick victory will bring them happiness and glory. So, what they did in Libya. they did the same thing. Guess who took over? Islamic fundamentalists. This is what happened in Tunisia: Islamic fundamentalists. Right now, yesterday, the Congress of the United States decided to give millions of dollars to the radicals of Syria. They are not giving it to intellectuals, to secular groups, they claim that they are fighting for democracy and secular regimes. But they are giving it to them because they want to get over, through this in a blink. A lot of this is backfiring, 3-4 countries backfired on them. And then after Syria, mark my words for it, it is Iran. It’s not that I love Iran, Iran regime is a fascist regime, but my point is that the United States will go there because if you look from Morocco to Iran, to Afghanistan, to India and everything, guess what? All of them are pro-American except Iran and Syria. These two places are not puppets. And the expansion of NATO against who? Now the Warsaw pact is not there! Against who? Why do you expand this? You took Saakashvili from Chicago. Do you know Saakashvili is from Chicago, he was the lawyer here, they picked him up and made him the president of Georgia, and now they find another puppet. Do you know that Karzai’s brother had a restaurant in Chicago? They picked him up from Chicago and gave him the same thing. Robles: Bashar Assad was a dentist in London. I couldn’t understand why they went against him. Gulzad: It is amazing, isn’t it? If you look at Lithuania, so many places, look at Ukraine, the guy who was the former president of Ukraine, his wife was from the United States, from Chicago. Robles: I’ve talked to many people and it seems like most of the world is being controlled by some part of Chicago for some reason. Gulzad: Chicago is the mafia city. It is just amazing. Robles: Now listen, here is a hypothetical that I don’t think anyone has ever talked about, but… You say the plan is backfiring. We see, everybody sees: ok, they are funding these terrorists, they are promoting terrorism actually. They are creating more terrorists. They are financing radical-Islamic-violent-people, right? Robles: Is it possible that that is, what they want? Gulzad: Well, they want to destabilize their enemy, the only way you can weaken a country and society is with a civil war, and how you do it? Like for example in China, you promote Tibet, you promote the idea of Islamist Uyghur and Tadjiks, it’s one problem. You go to Russia, make Russia very busy with the terrorists through Georgia, which Sakashvili was helping. From Georgia you head then to Dagestan, and, you know, Chechen area and you could create problems for Russia. That is the only way, see? And then you make excuses that I am staying in Afghanistan because the Taliban are still in power and al-Qaeda is still alive. Robles: That is what I am talking about. And then they can continue the endless War on Terror because they keep creating more and more terrorists themselves. That’s the history of United States, think about it. Castro is going to attack Florida. The Soviet Union is going to come and get us! The Russians are coming!! Okay? Then Saddam Hussein is going to come and invade the United States. Then they created this man, this stupid man with a beard called Osama, Bin Laden, okay? So, what they did, they made Americans wave the flag! “We are Americans!” And the became very patriotic and all this. So, they continue finding these external unbelievable forces. And their motive is this: as I said before and just recently I gave another interview, that what they want to do is they want to stay in Afghanistan. They want to stay in Iraq. Permanently, they will stay in Afghanistan because of Russia, because of China, because of the BRICs, China, India, and Russia, in this part of the world. Plus they don’t like Iran, so they want to destabilize Iran through Afghanistan. These are all excuses. Where are these terrorists? If you want to finish this thing, tomorrow you tell Pakistan that: “You will not get a penny”, Pakistan is a very poor country, and it is all over, give me these terrorist groups, one by one”. Robles: Listen Doctor Gulzad, we have to finish. I really loved speaking with you. Can I call you again? Gulzad: Call me any time. Robles: Thank you very much sir! You were listening to an interview with Dr. Zalmay Gulzad, a Professor at Harold Washington College in Chicago. Thanks for listening, and as always I wish you the best.